It was the best of trails and the worst of trails. 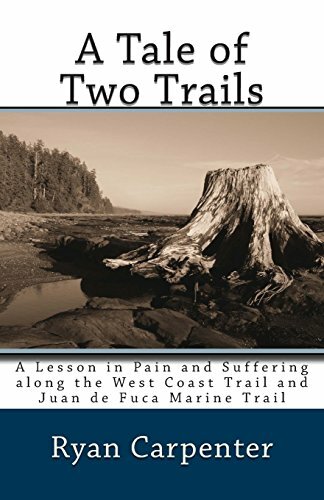 Each year, thousands of hikers from around the world make a pilgrimage to the West Coast Trail: a rough and tumble trail along the coast of Vancouver Island lurking with dangers and difficulties, home to hundreds of shipwrecks and rated as one of the most scenic trails in all of North America. Its sister, the Juan de Fuca Marine Trail, picks up where the West Coast Trail ends, continuing down the Canadian coast following a popular, well-developed trail through breath-taking scenery. And Ryan Carpenter, intrepid explorer, ventures out with two ridiculous homemade backpacks, a duffel bag and an umbrella to conquer both trails through a rain forest that receives over 10 feet of precipitation each year. Whether trying to outrun a helicopter on foot or searching for bloodthirsty smugglers, it’s a hike that nobody will forget. After losing his job as a software engineer, Ryan Carpenter headed off for exploration and adventure culminating in a thru-hike of the Appalachian Trail from Georgia to Maine in 2003—his first long-distance trek. Since then, he’s gone on to thru-hike the Florida Trail and Pacific Crest Trail. Nowadays, Ryan lives in Seattle running Atlas Quest, a popular letterboxing website (http://www.AtlasQuest.com) and encouraging backpackers everywhere to ditch their heavy commercial stoves for cheap, lightweight, homemade soda can stoves (http://www.TheSodaCanStove.com).